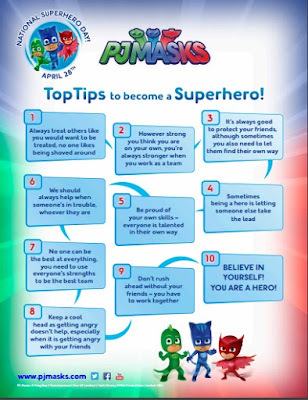 Welcome to TMG: Celebrate Superhero Day With PJ Masks! Celebrate Superhero Day With PJ Masks! Today Is National Super Hero Day! What a better way to celebrate than with the preschool superhero's themselves PJ MASKS! Read all about their top tips on how to become a superhero and then print out fun Masks, and activities from their website!